KUCHING: Two more cases suspected to be rabies have been detected in Sarawak. Health director-general Datuk Dr Noor Hisham Abdullah said both cases involved two persons who were warded at the Sarawak General Hospital (SGH) in Kuching, including one who had passed away on Friday (Dec 7). “We are still waiting for lab test results to confirm (if it is rabies). Clinical speciments have been sent to the Institute for Medical Research (IMR) and are still being processed,” he said in a statement today. On the fatal case, he said it involved a 74-year-old man from Kuching who was sent to SGH on Nov 25 when his condition worsened after he had sought treatment for pain on his left side of the body a day earluer. On Nov 28, the patient was admitted to the Intensive Care Unit (ICU) and died on Dec 7 at 3.15am with clinical rabies cited as cause of death. Investigations found the patient had no animal bite history, though he owned a dog and a cat which had been given anti-rabies vaccination this year. Both animals were also found normal and did not show any symptons of rabies. On the other hand, the second case involved a 64-year-old man also from Kuching. In middle of September, he was bitten in his calf by a puppy, which also bit his wife at her thumb. The puppy was picked up and kept by the couple as a pet a week before the incident. It was then released by the couple in Matang area after the incident and the latest status of the puppy was not known. The patient only washed the wound after the incident and did not seek treatment. However, the patient felt pain on knee and weak limbs on Nov 27 before proceeding to go to a private clinic to be treated. At the private clinic, he did not inform the medical practitioner of his dog bite history. On Dec 2, he sought treatment at the SGH after his conditioned worsened and tranferred to infectious diseases ward for further observation. As for his wife, she had not shown any rabies symptoms but has given vaccination. 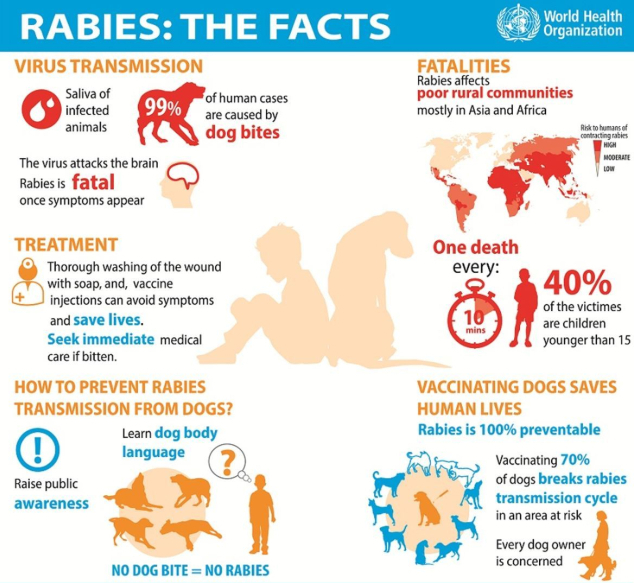 “Since June 30, 2017 until today, the confirmed rabies cases among humans are 14, of which 13 has died while one more case is under home treatment with neurology complications. “Up to December 7 this year, Sarawak government has gazetted 56 areas in 11 divisions as rabies infected (after animals were found with rabies). Only Limbang is still free of any rabies cases involving animals,” he said.